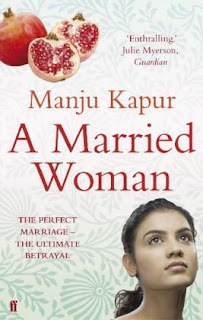 I remember a few bloggers reviewing Manju Kapur's books positively and had wanted to pick something up by her for the longest time. My library had a couple of books by her and for some strange reason I was attracted to this book.Guess it had something to do with the fact that I was intrigued by the storyline- about a relationship an older woman has with a younger one and wanted to see how the subject's been handled by an Indian writer. Astha is a middle class woman ,who lives in Delhi with her husband, two children and in-laws.She has everything a woman would need, but still has niggles of dissatisfaction bubbling in her. The story is really about how Astha changes from a unsure,college girl who has dreams of a mills and boons-type hero swooping in and carrying her away to a mature ,middle-aged woman who feels a little alienated in her marriage as time passes. Manju's writing is not spectacular ,but she adroitly captures the essence of trials and tribulations of a middle class family in the 80's. She takes time to build characters,but does a good job of keeping the reader glued to the pages. I am sure a lot of people will relate to a lot of things Astha or her family goes through like how they struggle to buy their first house or what is perceived to be the role of a woman in a traditional Indian household. The beginning of Astha's "rebellion" against conforming to the norm starts when she starts taking interest in conceiving a play about the Babri Masjid troubles. She meets like minded people and drifts off into the world of activism.Her family's attitude towards her activism enrages her all the more and she inadvertently falls in love with Pipee, an NGO worker. Their relationship has friendship as a base and deepens into something more as time passes.The rest of the story is about what happens to the relationship between Pipee and Astha and also how Astha manages a double life- the life of a lover of a woman and that of a married woman with kids and responsibilities. The intimate scenes between Astha and Pipee have been handled very sensitively by Manju,so have the incidents surrounding the Babri Masjid demolition and riots. At times Pipee came across as an overly selfish, immature person.she would have to be my least favorite character in the book. Hemant(Astha's husband) is portrayed realistically with many idiosyncrasies. Some might feel that Hemant's demands on his wife were excessively unrealistic,but I guess he represents how a lot of Indian men were like in the eighties. The backdrop of political agitation imparts a bitter-sweet tinge to the main story. Manju switches from a third person narrative to a first person narrative (where she captures Astha's take on the activism directly) somewhere in the middle of the book.The abrupt change seemed a little weird and makes the narrative choppy. Overall, an okay read. Not brilliant,but entertaining and a thought-provoking piece of fiction. Rating: 3/5 . I'll recommend it people who like Indian writing. I think I will try this author out and this plot does seem like something new..
which one ? My first Chitra book was Palace of illusions - I loved it ! .. some of her others had a little getting used to ! ditto on being in the mood for some Indian fiction..
Review of review:- You are very good in reviewing books. I do not know if I can get a copy of it but will try. I have read very few of Indian writers and am actually keen on redaing more.. Recently read Palace of Illusions and enjoyed it.. Hope to pick this one up some times soon!